RUST players are always on the lookout for new tips and tricks to stay competitive with their next base design. Our partner xRaW has put together a list of 10 building tips and tricks for RUST. These will help add an arsenal of theoretical tools to your RUST base building toolbox. While some of these base building tips and tricks may be well known, the video covers a breadth of topics such as the new un-lootable loot room, stability bunkers, reverse bunkers, airlock systems, and a number of other useful RUST tips and tricks for 2019. 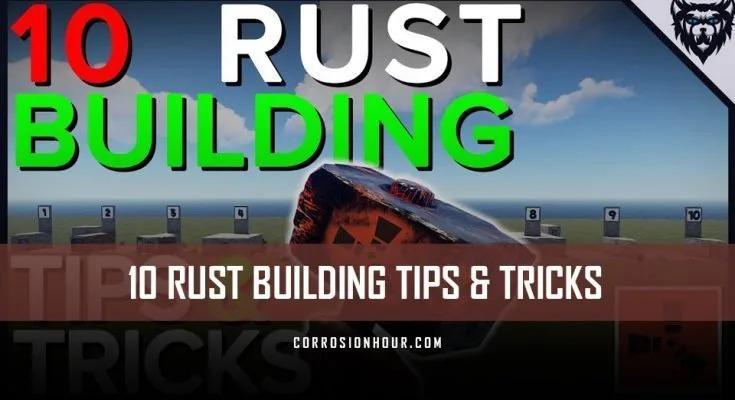 Hey guys and welcome back to another video, in today’s video we’re going to be looking at 10 RUST Building Tips and Tricks. Tip number one is basic one, but I keep seeing people miss it. When placing your airlocks, you want to ensure that either your internal, or external door opens to block the other door, otherwise if you die with your doors open, people can run straight like this. Its a simple, but important tip. You can also do this with double doors like this, place it so that it opens towards the single door, blocking the way. For number 2, we have un-lootable loot rooms, something that many thought were patched until Twisited brought them back. Placing a half height floor blocks people from getting the height to loot the dropped loot bags. For number 3, with any bases that have windows on the front, or honeycomb next to an airlock, you can simply add a door frame and stick 2 sheet double doors here, opening inwards and this will block the single door and increase the raid cost. For number 4, I wouldn’t call it a tip as such, but many people miss it. Rather than having multiple double doors opening and blocking your path, simple fill up any spare sockets with garage doors, this way you can easily get around your base without it feeling cramped. For number 5, is a method that I have used a lot lately in my builds. It’s a stability bunker but not as you know it. Placing a raised foundation like this allows the build socket, therefore if you place a twig floor you can place a roof on top and upgrade, creating an easily removable bunker base. This can be done in another way as I show here. Placing a twig floor and upgrading a roof on top of it blocks a doorway, preventing raiders from progressing into the base without wasting materials to blow the roof as well. For number 6, we’re looking at shotgun traps and placement. Everyone loves shotgun traps, but I constantly see people placing them in locations that are easy to shoot out and therefore don’t work. You must place them so that any raiders CANNOT see them from any angle, this makes them un-drainable and slows down or completely stops raids at times. For number 7, is honeycombing. People tend to love the idea of 2x2s, but they actually end up being more expensive most of the time. You want to build a base that uses triangles between squares, creating a square/triangle pattern. These means that honeycomb will double up in placing, saving a wall here and there. Here you see I have 3 walls and 2 foundations protecting 2 squares, but on the 1×2 here, I have 4 walls and 2 foundations to protect the same area. This method can be used in a number of situations, like here we have a triangle on the inside of the way, and therefore only 1 wall and 1 foundation is needed to honeycomb both walls. For number 8, is loot spacing. Many people place loot rooms next to each other, meaning any splash damage explosives can raid 2 loot rooms for the cost of 1 as you see here with the rockets. You must make sure you place loot rooms away from each other to avoid this, and make sure you have plenty of doors between them like this to make sure that no splash damage carries through. Using space effectively is important in bases. For number 9, we look at this. You want to make sure you make the most out of your space, in here we have 2 furnaces, a tc, workbench, 2 large boxes, 2 small boxes and a camp fire – all in a 1×1, And in here we have your TC and 5 large boxes. For number 10, it’s not necessarily a building tip, but in some ways it is. You want to ensure you have a sleeping bag in your main base so that you can re-spawn, make sure to name it. You also want to build a small 1×1 base nearby, un-important if its raided, that houses another bag in case your main base bag is on a timer. If you don’t want to waste resources, simply place it in a bush somewhere outside. I do a number of base building guides on my channel so feel free to check those out! As always if you did enjoy, be sure to like the video as it really helps out, and subscribe with notifications turned on to catch all of my content!